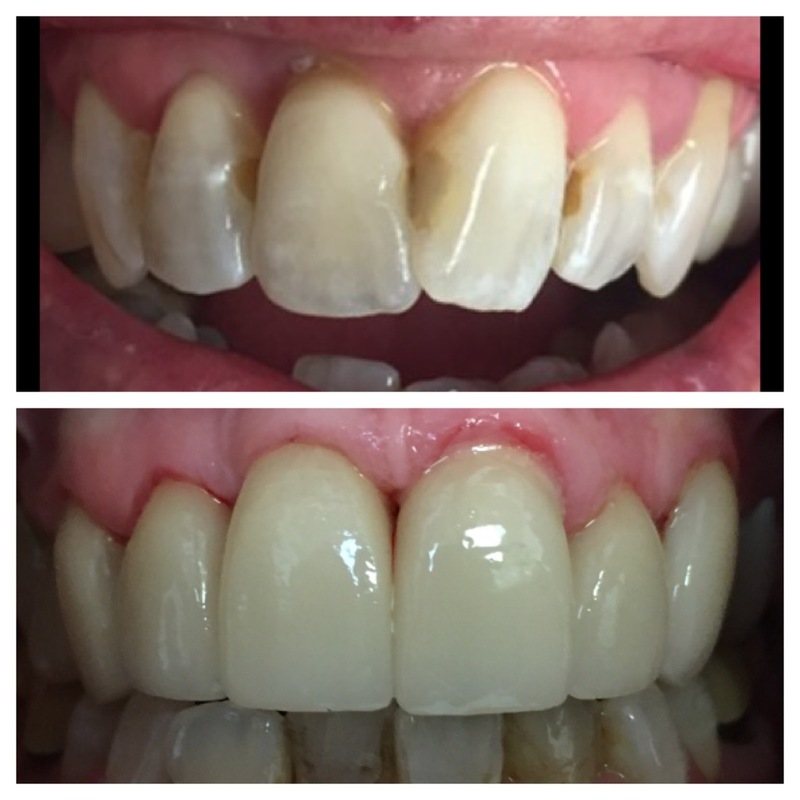 An example of an actual patient cosmetic restoration before and after, involving veneers and crowns. Cosmetic dentistry is essentially encompasses all forms of treatment for teeth, right down to restoring, replacement, and even a simple whitening procedure. All dentists are educated on how to properly perform treatment procedures cosmetically to ensure a patient’s smile looks its very best. Cosmetic techniques largely pertain to improving the appearance of teeth for an enhanced look that is both natural and noteworthy. Over the past decade, there has been exciting advancement in terms of techniques and materials dentists can choose from to give patients the smile they’ve always dreamed of having. Porcelain veneers have grown in popularity as a means of transforming broken, worn teeth into a more even, brighter smile. So many of the shining smiles we see on television, in magazines, and on our favorite celebrities are a result of dental veneers. 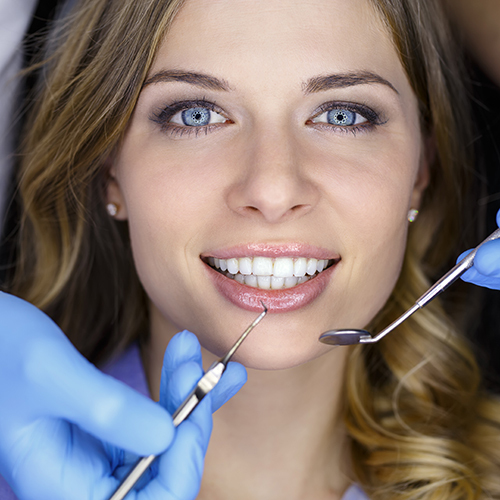 At Perry Hall Family Dental, we know how important it is to have a healthy smile that also looks great. Which is why we offer dental bonding as one of our many cosmetic dentistry procedures. Composite bonding is an alternative to veneers, designed to achieve similar results. Part of having a balanced smile comes from treating the gum as well. Dr. Fried is specially trained at gum recontouring to provide a complete redesign of how they interact with teeth. By exposing more of a tooth’s enamel, your smile can change dramatically. Restore your confidence with our cosmetic dentistry services that are guaranteed to bring out your teeth’s natural radiance. We not only improve the look of your smile, we transform it by focusing on the overall health of your gums and enamel. From veneers to smile whitening, we have exactly what you need to make your smile shine, and your confidence grow! It’s time for perfection. Porcelain veneers deliver dramatic results for teeth that are chipped, cracked, discolored, or broken. After the surface of your tooth is prepared, thin sheets of porcelain are adhered, giving the look of a bright, even smile. The porcelain veneers are expertly matched to the same shade as your natural teeth, so they’re virtually undetectable. They’re durable, and perfect for patients who want a lifelong solution to a variety of cosmetic issues. Like traditional veneers, minimal-prep veneers redesign the look of your teeth with very little effort. We use Lumineers, a minimally invasive brand of veneers that require less preparation of the healthy enamel. This means less sensitivity and oftentimes less need for anesthesia. Dental veneers can transform your smile, fixing a wide variety of common problems. Ask us if minimal-prep veneers are right for you. Sometimes, your teeth may be in need of a restoration, but you don’t have enough healthy enamel to support them. In these cases, Dr. Fried may recommend crown lengthening, which is performed in the comfort of our office, and involves reshaping the gum and bone tissue. Aside from enhancing your smile’s appearance, crown lengthening can support your periodontal health. Patients suffering from gum disease can benefit from this treatment, as it shrinks the gum pockets and makes them easier to clean. Correct receding gums, and eliminate gummy smiles with expert sculpting of your gum tissue. Dr. Fried is highly skilled at gum recontouring, which involves redesigning and reshaping your gumline to expose more of your natural enamel, instantly lengthening your smile. You’ll be surprised how little is needed to even out your smile and make it appear more vibrant. In addition to cosmetic uses, gum recontouring is also performed on patients with periodontal disease. It’s the little things. A chip here, an irregularity there. Small imperfections in your teeth can make you feel self-conscious about your smile. Ask us about composite bonding. This cost effective alternative to veneers is perfect for patients with small gaps, discolorations, chips, and cracks. We match our composite material to the shade of your teeth, and the whole process requires very little preparation of your tooth surface. Don’t fret the small stuff anymore. Smile about it. Do your teeth overlap, or are they uneven when you smile? Tooth recontouring can correct irregularly shaped teeth, including those that are too long or crowded. A little is all that’s needed with this procedure, as dramatic results can be seen with just a small amount of recontouring. Bring out the best in your smile. A smile is only as bright as it’s wearer. Unless of course, they opt for Perry Hall Family Dental’s smile whitening services. Get the brightest, whitest smile you’ve ever had with Opalescence tooth bleaching kits. We provide you with custom fit trays to take home, so you can get whiter teeth when its convenient for you. Want to know how to get white teeth? Ask us at your next appointment.